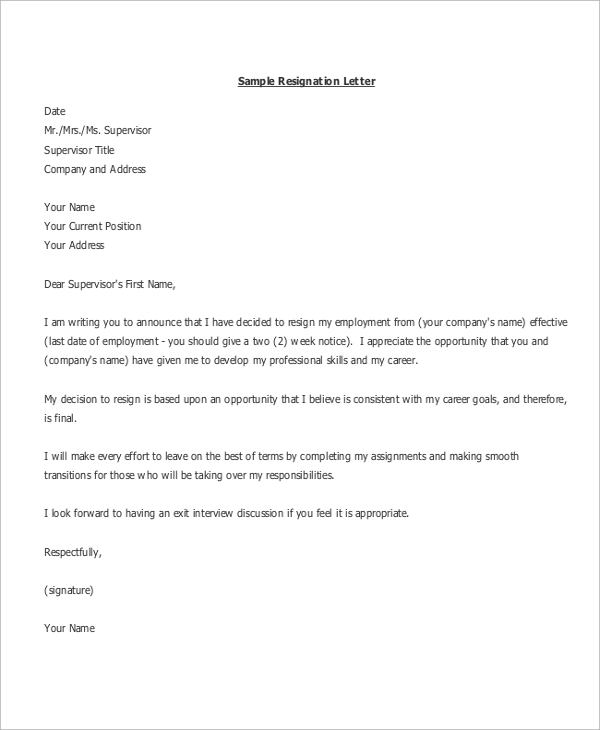 The Resignation Letter should largely be about giving a chance to the employer to thank you for your services and leave on a positive note. Any good recruiter will appreciate if an employee decides to shift for a better opportunity that provides growth in career, challenges, and remuneration. The letter is not supposed to suggest anything personal that you had against the company or the people you worked for/with. It’s a very delicate conversation and should leave a window open for future references/considerations. In most workplaces, it’s policy to notify your resignation/shift two weeks before you plan to do so. This opens up a window of opportunity for negotiations and finding a replacement. 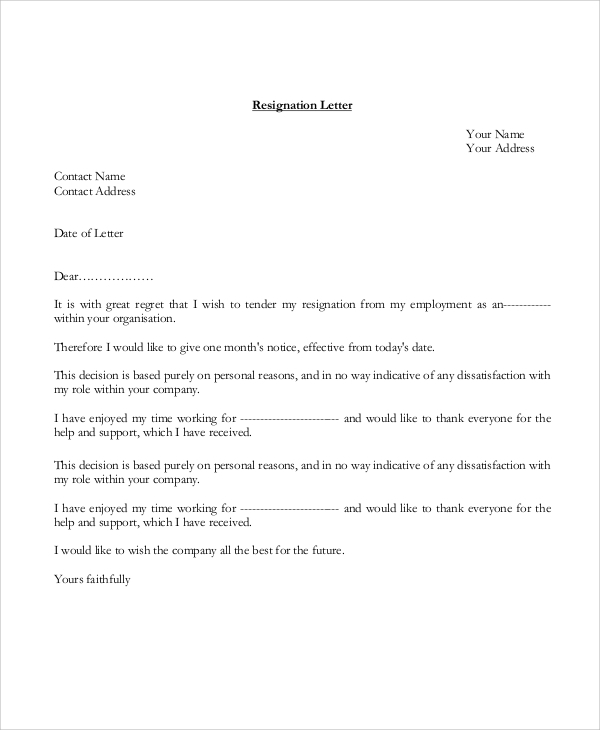 The content of the letter should be precise and be kept to the point, including a short explanation of the reason for your resignation. 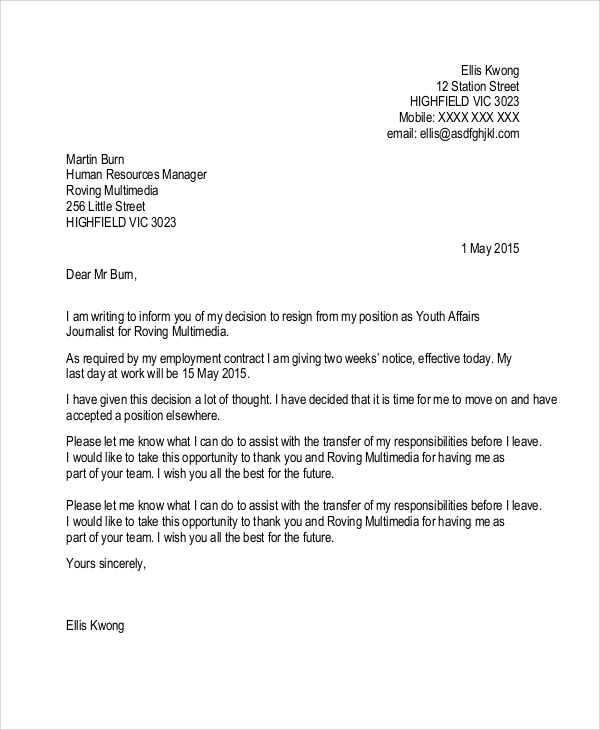 A formal employment resignation should be very brief and precise. It is necessary that you include the brief reasons for your decision and also suggest that it hasn’t been an easy decision on your part. Every employer would like an employee with future goals. There’s a delicate way to end things and this sample should help you frame the correct statements. It’s necessary that you leave on a positive note. 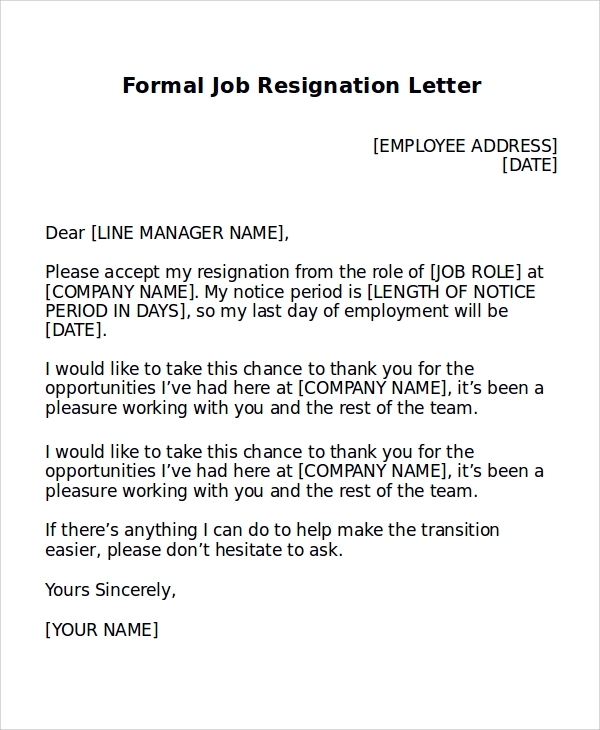 This sample shows how effectively to notify about your plans of leaving the company without leaving any harsh remarks. In the modern job environment, references help a great deal and ending your employment on a positive note adds to this asset. Leaving with sour relationships can very well hurt your plans. 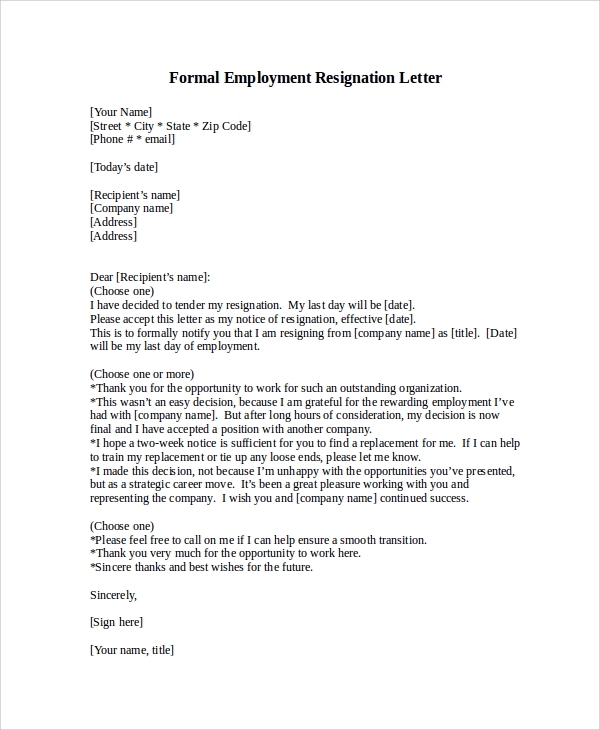 When to write a Formal Resignation Letter? 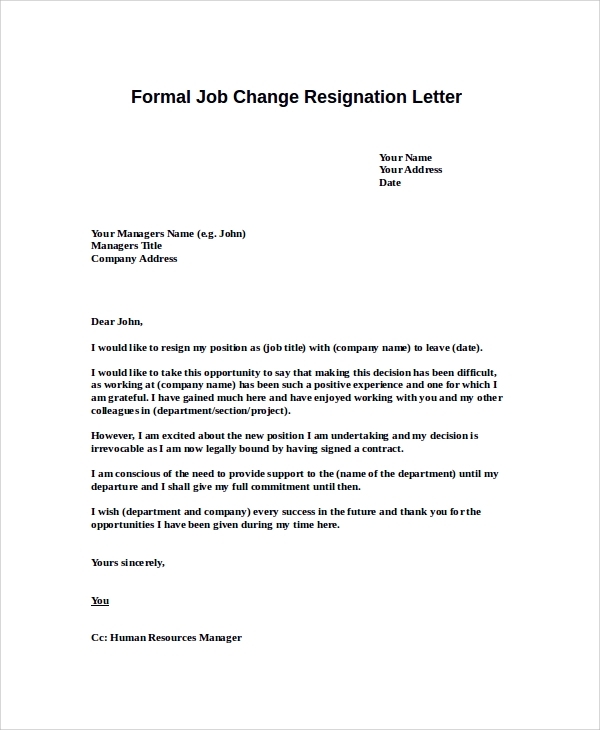 It’s policy in most companies that a Resignation Letter should come with a comfortable notice period. The duration varies between companies and is necessary to help clear your dues and other formalities. It’s not unusual for a recruiter when an employee chooses to make a job change and goes to work for a different employer. However, the resignation should be as humble as it can be. Putting in only the necessary details, it’s not the platform to showcase your sourness (even if it had been the reason) but a step in the official process. Who needs to Write a Resignation Letter? Any employee who seeks a job change or permanent leave from this position needs to write a Resignation Letter. It’s not just about to inform the employer but is also an official requirement that can be referred to later. Resignation is never an easy thing. However, if you are doing it for your own good, it should also leave back a positive relationship with the employer. 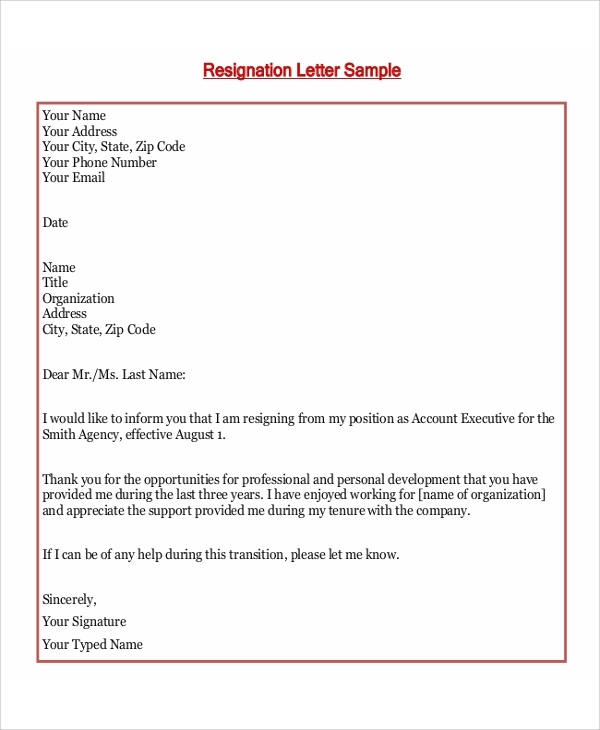 We hope that these Resignation Letter Examples help you out in writing one yourself.